“Fitness and gym have always been a big part of my life. Starting with my 9 years of ballet as a kid to signing my first gym contract; the dynamic of my fitness changed dramatically. I wanted to lift weights and grow muscle but without a proper eating plan I spent a few years plodding around and not understanding why things were not changing. Then two years ago the stage bug bit me hard when I a friend from gym entered her first competition. I decided I was going to do it and do it alone. I didn’t have a clue what needed to be done or what the process was. I got an eating plan from a prep coach but I hated every moment of it. I was gagging on the food and I was literally starving with copious amounts of cardio. I was also told by this coach that I would never be able to do it without some form of “pharmaceutical” assistance. I gave up. I didn’t want to take anything and if I couldn’t get to the stage naturally then why bother. If I was going to do this comp thing the time was now. I gave myself 16 weeks and to be honest when I sent Craig my first pics I was not hopeful but gave it a shot anyway. I followed his plan to the T (Besides my cappuccino on the weekends, a habit that died very hard) but I was determined to make it work this time. Craig was patient, he listened he guided; he soothed and picked me up off the floor on more than one occasion. We struggled with my “rear” and I wanted to break my scale on many occasion but he would just patiently listen to me ranting and moaning, give advice and give me hope which is what I needed more than anything. He did not loose patience once in the 16 weeks. He did not shout, he never ignored (unless I was asking for chocolate). The man deserved a damn medal for how much he put up with from not only me but Tasha and all the other girls he was prepping as well as his normal non prep clients. I would often send him pictures and say… “There is no difference Craig!! !” he would then spend the next 40 minutes pointing out each difference and by the end of that conversation I would be hopeful! 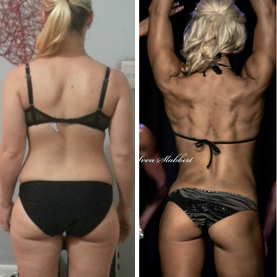 Over the 16 weeks not only did I have a winning diet plan that was constantly tweaked, I had a fantastic coach who supported and believed in me. I had also made a close friend. Craig was someone real, and someone that constantly cared and worried about how I was doing… but not just because he was paid to do so, because he really cares for each and every client that he signs on. Craig and the whole CSB team became my second family. I was very lucky to have one of my very close friends, Tasha Pienaar, as my prep buddy, confidant and motivator. We pulled each other through the dark days and we high fived on our strong days (the conversations towards the end were mainly about scones, jam and cheese… truck-loads of it and how we were going to roll around and just eat until we puked post-comp). Show day came and things just pulled in, the tears from the week before forgotten and the excitement overtook us all. Craig was there with the rest of the CSB supporters cheering us on. He sat there from the morning right up until the last CSB athlete walked that stage that evening. It was a long day but Craig was there every step of the journey, and even more so on the final day.